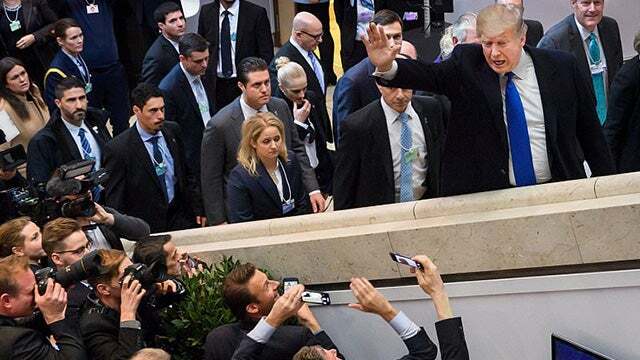 RUSH: So Trump is over in Davos, and it isn’t going the way Drive-Bys dreamed it would go. Trump is being embraced. Trump is being celebrated. Trump is being lauded. The Drive-Bys expected Trump to be protested! They expected Trump to be shunned. They hoped for all of this, and what this presents us today is a great opportunity. You know, our all-time favorite audio sound bites — and it’s tough; I mean, it may not be the all-time favorite, but it ranks right there. 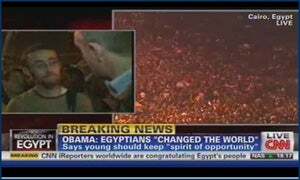 It’s our old buddy Nic Robertson of CNN in Cairo (laughing) during the Arab Spring trying to get Egyptians fighting for their lives to praise Barack Obama, to thank Barack Obama for having their backs, for being their inspiration. And these Egyptians couldn’t care less about Obama and they tell Nic Robertson that Obama’s not even on their minds and Obama, if anything, sabotaged what they’re doing. And he talks to three of them, and at the end of it, sums it up by telling us we just heard how much love and adoration there is for Barack Obama on the street, by average Egyptians. So we’re gonna replay those. It’s the sixth anniversary of those bites, and the reason we’re gonna replay ’em is because Nic Robertson and his gang are back in Davos. And they’re trying to drum up the exact opposite on the street there for Trump! They’re trying to drum up a bunch of people that hate Trump, that wish Trump wasn’t there, that wish Trump would leave. And they can’t find anybody other than those who want to praise Trump. RUSH: Now, let’s go over to Davos. Again, it’s necessary to set the table as seen by the left. So Trump is going to Davos. And let’s leave aside for a moment the little press gaggle he did with reporters last night where he seemed unfazed by Mueller, totally willing to talk to him. I mean, that ticked them off like you can’t believe. See, Trump’s supposed to be scared of Mueller. Trump’s supposed to realize that Mueller can destroy him, and Trump acting not frightened and fearless and eager to tell Mueller the truth? This is the narrative. This is the way the media looks at them. “The people in Davos, the CEOs and the government leaders are proper, globalist, leftist types who are sophisticated, who are refined, who are brilliant. None of which characteristics Trump possesses! He’s not refined, he’s not sophisticated, he’s not smart. He doesn’t know what he’s doing,” and so when Trump goes to Davos, he’s either to be rejected or made a fool of. But regardless, in the Drive-By Media world, Donald Trump is going to meet his match in Davos and be seen leaving whimpering, not knowing what’s happening to him. The glitterati at Davos… If you don’t know what Davos is, think ski resort meets Studio 54. It’s a party. It’s a party among the world’s elite, sandwiched around a bunch of so-called serious meetings about the world economy. It’s just an excuse to get together and party away from the office, and they throw in these serious things for tax deductions and image-making and all that. But Trump is not welcome. He’s not parts of the group. He didn’t qualify. Not smart enough, not brilliant enough, not experienced enough, certainly not politically and ideological correct. He’s just certainly not welcome, and they are going to… Finally, finally Trump is going to be shown for what he is! Okay. So that’s the narrative. RUSH: So the media sets it up in their own mind that Trump is gonna bomb in Davos. “He’s gonna be rejected in Davos. He’s gonna be asked to leave in Davos. They’re gonna hate that Trump is there. Trump is gonna be an enemy. These are big globalists! They know the real future of the world; Trump is an archaic dinosaur.” The exact opposite happened. 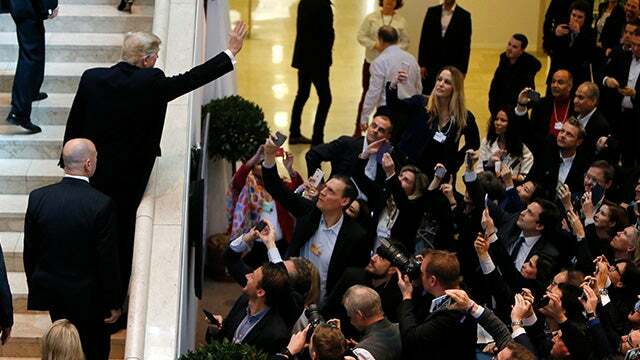 Trump arrived in Davos and is a rock star. Even Algore is defending some of Trump’s policies! 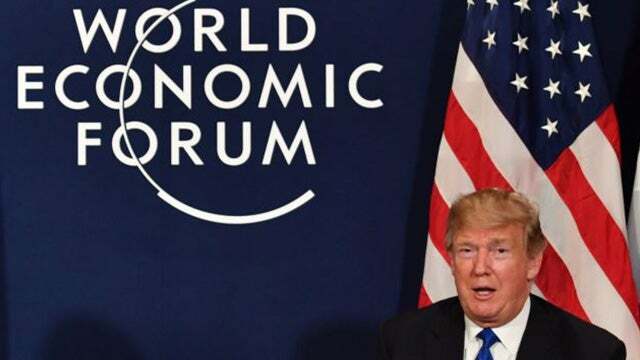 Trump’s tax cut and the resulting boom that is on the cusp here in the United States has been applauded in Davos. The CEOs that are in Davos are enamored of Trump, and they’re universal in support. Well, I’m sure there’s some stragglers, but there’s overwhelming support for Trump. And he has become a rock star. Everybody wants to be where Trump is. Everybody wants to be around Trump. The Dow Jones Industrial Average was up 200 points on the news of Trump’s reception in Davos. It’s now up about 160. The economic boom and the confidence. More companies are announcing bonuses. We’ve got Disney. We’ve got Starbucks. We’ve got Home Depot now joining the crowd of companies that are expanding wages and bonuses and benefits all because of the tax cut. Jamie Dimon at JPMorgan Chase and Lloyd Blankfein at Goldman Sachs? These are people that do not support Republicans. These are people that made sure Obama got elected twice. You know, this amazes me. I understand it, but it’s still amazes me. Here you have Blankfein and Jamie Dimon. JPMorgan Chase is Dimon and Goldman Sachs is Blankfein, and they do everything they can to support Obama and to be seen supporting Obama. And they fundraise for Obama. And they donate to Obama. And yet everything Obama’s doing is literally against their interests unless they can cozy up and become an Obama crony where they might be protected and shielded from the otherwise damaging imposition of regulations Obama planned and implemented. And that’s it! They didn’t have the courage to oppose Obama. They didn’t have the courage to stand up and say, “Obama’s not in our best interests.” They simply realized, “Hey, Obama got elected. It’s not our job to run his approval numbers down.” So they decided they have to get in bed. They create the image and impression — with their fundraising and with their donations — that they’re big time Obama supporters. And that is why, when they end up embracing Trump, the media goes nuts and doesn’t understand it. But what Trump is doing is implementing plans that are in sync with the way these people would run their businesses. So it was a fear of Obama the big leftists in trying to do what you can to protect yourself against any action he might take. It was a purely defensive posture. It was not love and support for Obama that forced them to be on his side. It was fear, to a degree. But now with Trump they are free to openly express their enjoyment, their love, their support to what Trump is doing. Because it’s gonna help everybody. It’s gonna cause economic growth, and it’s gonna cause more investment in the United States than anybody’s ever dreamed of, and this is why Trump is a rock star in Davos. Because these are businesspeople. And they may be leftists and so forth. But in the United States, they’re not dealing with a leftist president they have to be wary of and cozy up to to protect themselves. Now, it’s more complicated than that. It’s a little bit more intricate than that, but that is a pretty good shell summary of what’s going on. Meanwhile, the Drive-Bys are looking at this, and they don’t understand it. They think everybody hates Trump like they do. They think CEOs, international leaders hate Trump like they do. They can’t reconcile what theory seeing. RUSH: Back we are, and to the audio sound bites we go from Davos. 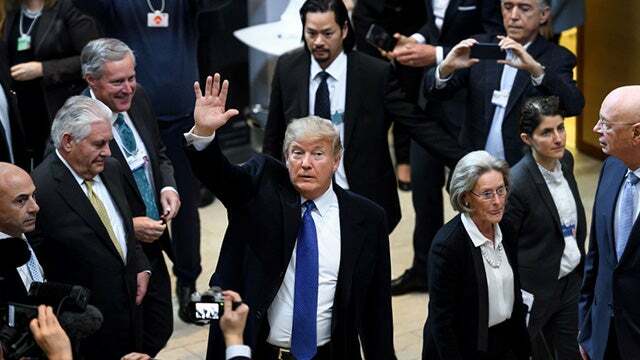 So I have properly and in a very detailed way prepared you for the departure of Trump to Davos the way the Drive-Bys were hoping he would be received as being rejected, hated, despised. And instead Trump is been embraced, is being applauded. People want to cram the room where he speaks and where he is meeting. He’s causing markets to skyrocket. Yet again, the DJI was up over 160 a half hour ago, last time I checked. CEOs that you would think would hate Trump because they loved Obama cannot get enough of Trump, and the Drive-Bys are beside themselves. 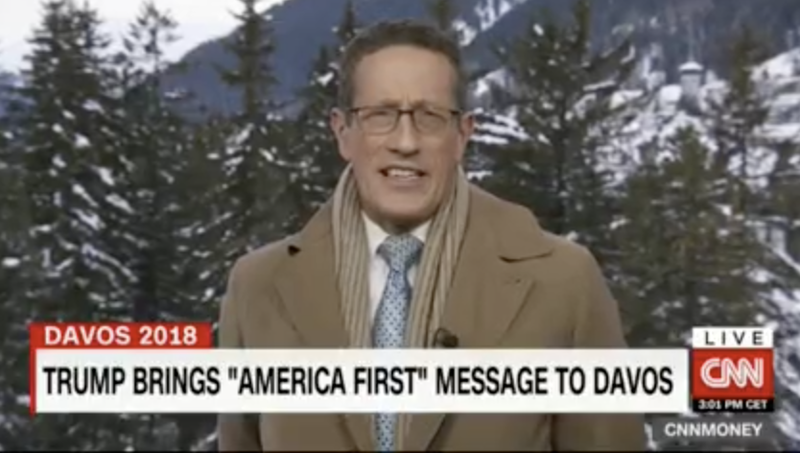 Nic Robertson and Richard Quest from CNN are on Trump’s triumph in Davos, and they’re not happy. Because they’re missing what’s going on. You gotta understand, these people hate Trump. The media despised him as much as they’ve despised anybody in recent times. But the funny thing is they just can’t deny what they’re seeing with their own eyes in Davos, which is the exact opposite of what they wanted to see or expected to see. Up first, our old buddy Nic Robertson. RUSH: Totally unexpected, folks. You can hear the shock, you can hear the awe in the voice of Nic Robertson. (impression) “Very happen to see you! Very happy to ask you questions, to stand there while you’re shaking hands with people. He was waving!” Did you hear that? “He was waving! The guy was waving, for crying out loud! How can they let that happen? He was waving. It felt like a victory lap!” They can’t deal with it. QUEST: I’ve seen Vladimir Putin walk through that lobby. I have seen President Xi last year walk through it. I’ve seen Theresa May, Tony Blair, and fuh… (sputtering) almost back to Mitterrand walk through that lobby! None of them closed it down in quite the way we saw today. ROBERTSON: It was still chockablock! It was absolutely round at the top, as people were on the stairs. It was chockablock at the bottom. Everybody wanted to get a piece of President Trump actually as he walked in here. RUSH: Did you hear this guy? Richard Quest is so hoarse. He probably has been shouting he can’t believe what he’s seeing. (impression) “I’ve seen Vladimir Putin walk through that lobby, I’ve seen President Xi last year walk through it. I’ve seen Theresa May, Tony Blair, almost back to Mitterrand walk through the lobby! None of them closed it down quite like the way we saw today, damn it!” They can’t believe what they’re seeing. They’re seeing a rock star. Now, what are they missing, Mr. Snerdley? What are they missing? (interruption) They have made Trump the world’s biggest, most famous celebrity! CNN is Donald Trump. Who cares that they’re ripping him to shreds? Who cares? They look like Chihuahuas yipping at his ankles. They’re still making Donald Trump. You know how celebrity works in America. They have made Trump the biggest star in the world, even bigger than Trump had made himself. Now, I am misspeaking. Trump is not being “made” by those people. I don’t mean to say that they can now destroy him by stopping the coverage. It’s not what I mean. But by not being able to ignore him, by being unable to ignore him and cover other things, they’re helping to make this guy bigger than life. I mean, people will flock to see any celebrity for any reason, and many times the bigger the reprobate they are the bigger the crowd they draw depending how they have been covered in entertainment or political media. But they’re missing this. I know these are Europeans, but these are people who don’t mind growing economies. These are people looking forward to expanded business opportunities, these are people that I believe want to be involved with a growing United States. I have never believed that the vast majority of people want the United States cut down a peg or two. I believe the sensible people in the world want the United States as a benevolent and great superpower. I think they want the United States leading and protecting and guiding the world. I believe a significant number of people are made to feel better when the United States is not apologizing for itself, when the United States does not see itself as the problem in the world. 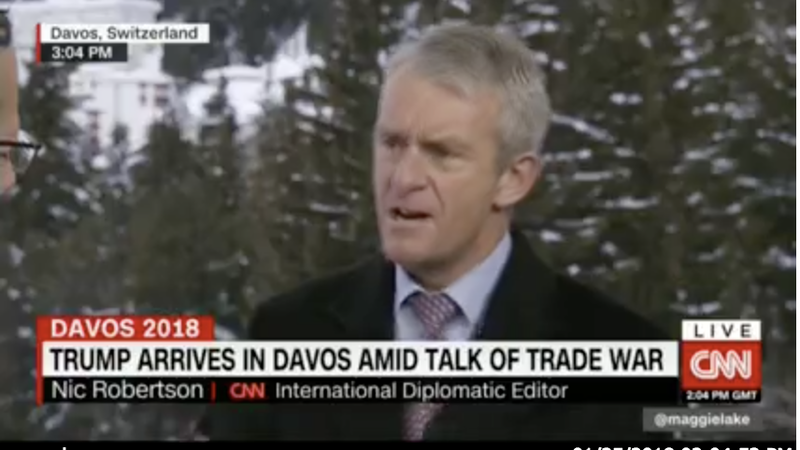 I think they’re happy to see this, because none of these other people at Davos are capable of making happen on their own what Donald Trump has made happen. There’s not a single one of these people — from George Soros on down — that can create a positive, worldwide economic expansion like Donald Trump can. (interruption) Of course… (interruption) Who tells you that they’re supposed to be mad at him over the Paris accords? Who’s telling you that? The media! The Paris accords? I don’t doubt that there are some people like De Blasio… Do you think Bill de Blasio represents a majority of thing in the world? The Paris accords. Secretly… I’m just gonna tell you. Secretly, there are people don’t have the guts to be public about it, but they were applauding Trump telling the Paris accords to take itself where the sun doesn’t shine. That stuff’s not common sense! The Paris accords was nothing more than nations of the world being asked to harm themselves economically, to punish themselves. The Paris accords had no teeth anyway. None of the promises or commitments had to be met. The Paris accords was a phony baloney, plastic banana, good-time rock ‘n’ roller PR exercise to begin with. RUSH: This is the sixth anniversary of some of my favorite audio sound bites ever aired on the EIB Network: Our old buddy Nic Robertson from CNN. These sound bites are from February 11, 2011, on CNN. Nic Robertson is the foreign correspondent, and Nic Robertson was sent to Cairo, Egypt. This was after the Egyptian president Hosni Mubarak stepped down. The Egyptian people were throwing parties and they were celebrating over this. This was the Arab Spring just beginning, and the Muslim Brotherhood was attempting to take over control of Egypt, and Nic Robertson went to Egypt, went to Cairo to talk to people involved in the protests and the attempts to expand the Egyptian economy. And his reason, his purpose was to interview Egyptians on the street and ask them how much they were praising Obama for making it all happen. And the answers that Nic got are delicious, they are delectable because Nic didn’t get anything he wanted. He didn’t get a bunch of Egyptians doing back flips over Obama and praising Obama and thanking Obama as Nic wanted. Nic wanted stories to make it look like Obama was single-handedly inspiring all this good stuff happening in Egypt because they were trying to copy the excitement of the Obama campaign and the Obama election, because Obama was taking over the world. The world loved Obama! I don’t think the world ever really did, frankly. I think that’s another bill of goods that we were sold by the media. I don’t think Obama was unilaterally, universally popular. He was with fellow leftists, but I don’t think… Obama didn’t even end up that popular in America. His approval numbers are way down. People that he endorsed lost their races. I think we were sold a big bill of goods in Obama, particularly in the second term. But I love hearing these sound bites because they’re hilarious, and they are illustrative and instructive. So here’s the first, Nic Robertson finding Achmed in Tahrir Square in Cairo. ACHMED: We don’t know, actually, who he supports. He serves for his own purposes, and the Egyptian people seeks for our freedom and democracy. Any democratic country should see for the people, not for its own purposes. RUSH: (laughing) The audacity! Here’s this Nic Robertson. He’s a Brit, obviously, but he’s a total Obamaite and here he is in Egypt, and he’s asking (impression), “[T]he international community… You’ve just listened to President Obama saying that America will support Egypt if it wants help and assistance, and hopes that there will be a good transition for jobs for the young people. What would be your message for President Obama?” Nobody’s thinking of Obama in this situation! They’re thinking of themselves. Nobody’s thinking Obama. But to these guys, Obama was all anybody was thinking about, just like now the only thing they think everybody’s thinking about is the election and how Trump stole it. They don’t realize everybody’s moved on. So Achmed (impression), “I don’t know who Obama supports. He serves his own purposes.” Well, that didn’t work out, so Nic has to go out and find somebody else, ad now he finds Mustapha and tries to get the answer he wants. RUSH: (laughing) Nic’s 0-for-2 here, folks, so here we are in the middle of a bunch of people trying to fight for their freedom in Egypt, and this Nic Robertson says, “What will be your message for President Obama?” (Snort!) “Well, my message to President Obama is just, “We started this revolution without any outside help, and we are going to finish it also without any outside help. '” The message is: Obama doesn’t mean anything here, Nic! So Nic is not happy. He decides to stick with Mustapha to try to talk Mustapha into saying what Nic wants to hear. MUSTAPHA: Well, actually, President Obama’s views were kind of conflicting during the last week, but now he’s saying that he’s supporting the change. RUSH: (laughing) “Well, actually, President Obama’s views were kind of conflicting,” (paraphrased) “and we don’t know what the hell Obama thinks, and it really doesn’t matter, Nic! Obama isn’t here, and Obama’s not why we’re doing anything!” So Nic Robertson has struck out — I mean, gloriously and big time — with Achmed and Mustapha in Egypt. Now, let’s listen to now Nic sums up what we all just heard and what the CNN audience had thus seen. RUSH: No! There’s not a single person that said that, Nic! “The view from here is one of very happy to now hear that President Obama has swung behind the people.” Now, this is instructive for obvious reasons that here you have big Obamaites in the media — CNN, Nic Robertson — doing everything they can to make everything they think is good about Obama. Their desire is for the people around the world, not just in America, to think Obama is The Messiah, the greatest thing that’s ever happened to people in the world. So they go to where unrest is happening, people seeking their freedom, and they try to get people in Egypt to link what they’re doing to Obama, and he couldn’t find anything. I mean, if these are the ones they aired, can you imagine the people they found who were not airworthy? Can you imagine what those people must have said if this was the best they had? But it just goes to illustrate that when you’re watching the Drive-By Media, folks, it really does make every bit of sense in the world to doubt everything, to be suspicious of everything they say when they’re trying to build up their own people and their own ideas. And they do it trying to make their ideas seem like they’re dominant and winning, that everybody agrees with them. And in most instances, it’s not the case. RUSH: Grab audio sound bite No. 16. This is Jeff Zeleny at CNN. He used to be at the New York Times and grew tired of the money and wanted to be famous and make more money. So he went to TV, and he’s now a star correspondent at CNN, and he was on CNN’s New Day this morning talking about how they weren’t any protests over Trump in Davos, and that’s just… That’s not… That’s not right! There were supposed to be protests. ZELENY: So far here at least in Davos, no signs of protests. There are many questions: Why is President Trump here? I talked to one woman yesterday with a hat on that says, “I Miss Obama.” But the fact is, Obama, uh, didn’t come to Davos. It’s been 18 years since 2000 when Bill Clinton came to Davos during this final year in office. President Trump is doing it in his first year, the first time he’s ever been invited to this elite global gathering. RUSH: Right. See, they still can’t believe that he’s there, and even though Obama never went, everybody assumed it was his meeting. These guys have Obama on the brain! I’m telling you, they do, and they think everybody loved Obama — and in their closed, closeted world, everybody did love Obama. But they don’t know anybody who doesn’t.